If you try on those Astronaut Ice Cream Sandwiches and you find yourself wanting, then in Martha we trust, right? 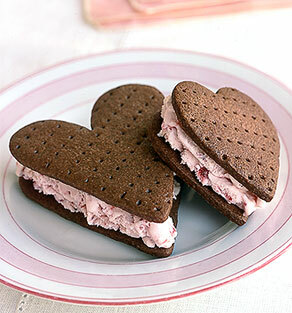 Take a look at Martha Stewart’s engagingly delicious Chocolate Hearts Ice Cream Sandwich Recipe. Are they not beautiful? Show that someone how much you love them by cooking this up for dinner tonight, they will not soon forget. Enjoy! 1/2 - cup cocoa powder ,2 1/2 teaspoons baking powder. -In a medium bowl- sift together flour, cocoa powder, baking powder, and salt; set aside. In the bowl of an electric mixer fitted with the paddle attachment, cream butter, vanilla, and sugar.Add eggs and milk, and mix until combined. Add reserved flour mixture, and mix on low speed until incorporated, scraping the sides of the bowl with a spatula at least once. Divide the dough in half, and shape each half into a flat disk. Wrap each disk in plastic wrap, and chill until firm, about 1 hour. -Go ahead & preheat your oven to 350 F or 175 C.Roll dough out on a lightly floured surface; use an offset spatula to unstick the dough every few turns of the rolling pin. Roll dough to an 1/8-inch thickness. Cut dough using a variety of heart-shaped cookie cutters from 2 1/2 to 3 inches in diameter, making sure there is a top and bottom cookie for each sandwich. - Place hearts on a parchment-lined baking sheet; chill until firm, about 30 minutes. Remove from refrigerator; use a fork to prick holes all over the surface of the cookies. Bake until firm, 12 to 15 minutes. Let cool slightly on baking sheet, then transfer to a wire rack to cool completely. Using half the cookies, spoon softened strawberry ice cream about 1/2 inch thick on each underside. Place matching cookie on top of ice cream, top-side facing out. Transfer immediately to freezer to harden; repeat with remaining ingredients. Serve directly from the freezer. Sandwiches can be stored in an airtight container in the freezer for 3 to 4 days. These are beautiful! I made some chocolate chip cookie ones today. But I think these are next on my list. So cute. These are amazingly beautiful and look SO delicious! Buzzed it! Really? hehe thats great! :) @S.V.